Last weekend my friends and I had our 3rd annual friendsgiving and it was a great time as always. There was turkey, ham, lots of delicious sides, spiked cider and many games of Heads Up and Phrase Party. Nothing beats quality time with my best friends and I always look forward to our yearly tradition! 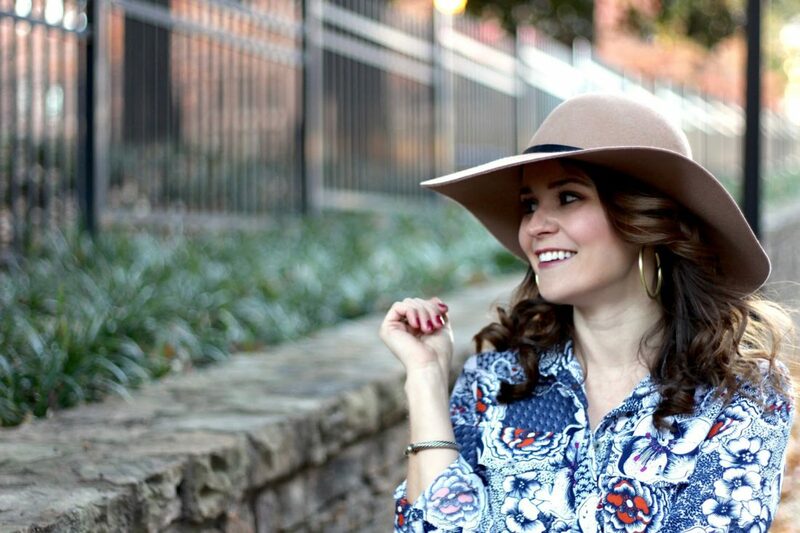 Today I’m sharing the outfit I wore and another giveaway for y’all just in time for the holidays. ‘Tis the season!! I accessorized with my trusty camel hat and my extra large hoops by Sheila Fajl. I love these because they’re big but also super light and don’t weigh down your earlobes. Ps. You probably can’t tell, but we were fighting gusting winds during this shoot and it was cold!! To all my fellow bloggers you know how it is- wind, lipgloss and floppy hats just don’t mix. It was a struggle but at least we got a few good shots! Hutch Design has so many bright dresses, printed tops and flirty skirts that are perfect for the holidays. I’m super excited to partner with Lindsay from Sell Eat Love and Beth from Seersucker & Saddles to give away a $500 gift card to Hutch!! You can enter the giveaway below and it will go through next Wednesday, November 30th. And if you just can’t wait, you can use code SHOPNOW30 to get 30% off everything on the site. Good luck y’all and hope everyone has a wonderful Thanksgiving! that dress! it's so gorg and i bet super comfy. perfect for thanksgiving! and love the hat with it – i definitely need to remind myself to take a hat home for the holiday 🙂 happy thanksgiving! Lovely lady in the maxi dress!! I could possibly be wearing it tomorrow as well. You style this dress so well. Love the hat and the earrings. 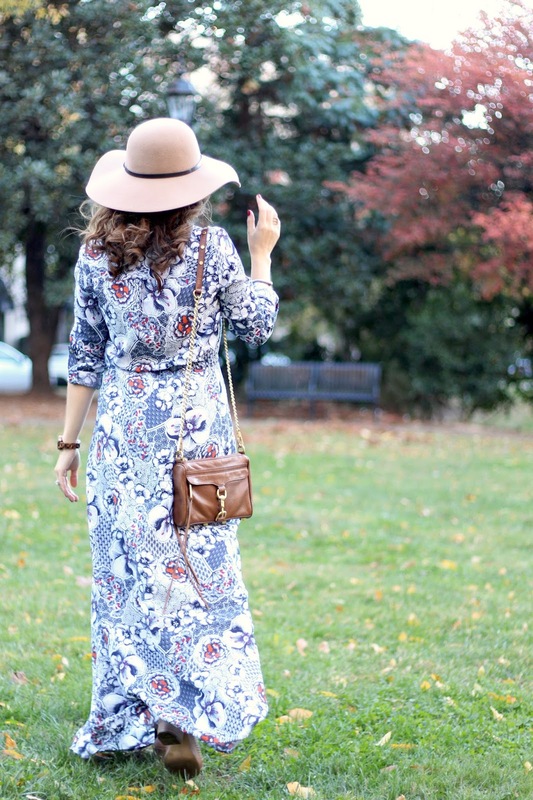 What a perfect maxi dress!! It must be so comfy too! I'm loving this dress! The print is gorgeous and love the colors! I love this dress on you! 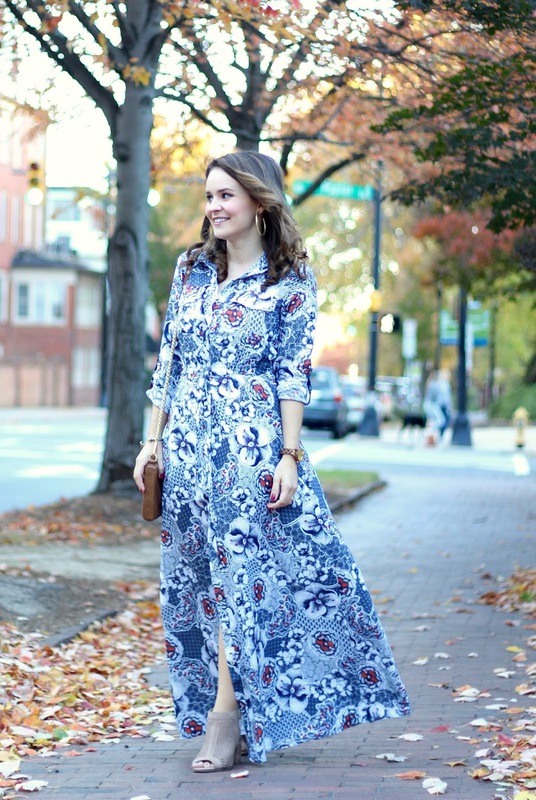 perfect maxi for the fall 🙂 Happy thanksgiving! This dress is gorgeous on you! Happy Thanksgiving! Maxis are my love language seriously!! 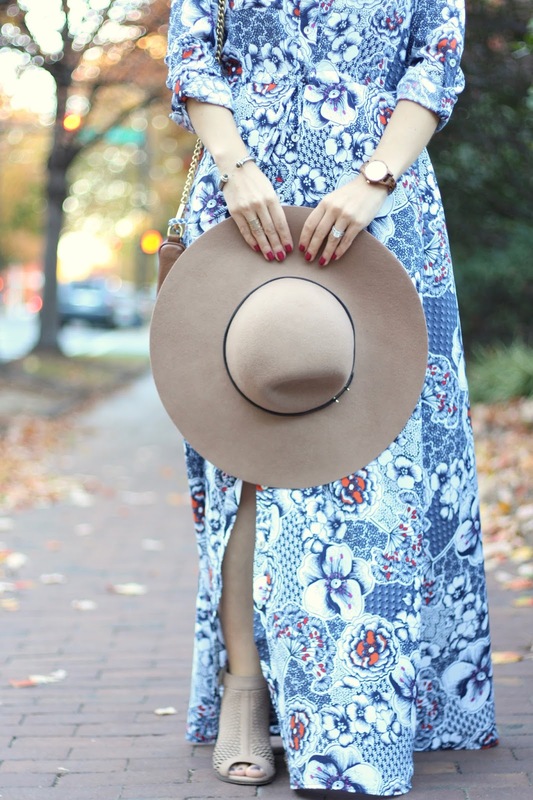 Such a pretty maxi dress. You paired it so well with that hat! 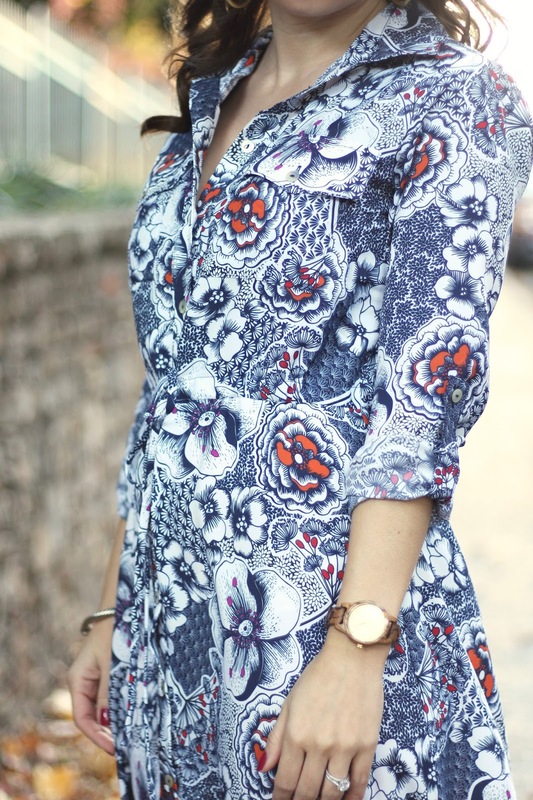 Love this dress and this print so much!! Love the colors in the dress. looks amazing on. I absolutely love this dress Kristina!! 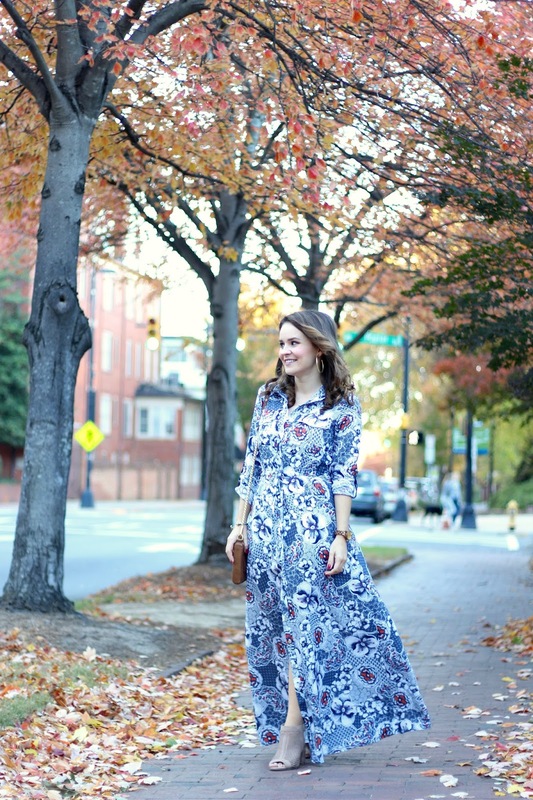 I love the idea of wearing a maxi dress this fall!